A Rare 19th Century Welsh Carved Treen Loving Spoon Stand. The two chip carved spoons with looped handles threaded through suspension rings carved to the base rail of a small rectangular mirror frame surmounted by a square finial carved with a flower-head. The chip carved central stem having a fretted mid-height section piercing the spoon shafts above a square moulded plinth base, 18¾ in (48 cm) high. 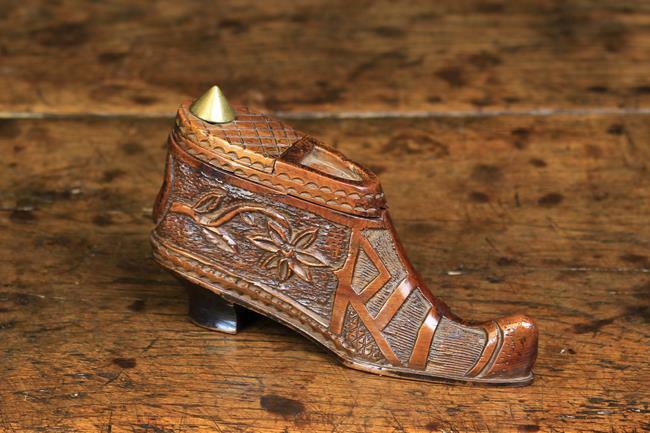 A 19th Century Treen Shoe-shaped Snuff Box with pivoting lid. The sides carved with flowers and strapwork defined against recessed nail-punched panels; the kitten heel enhanced with ebony stain. 5½ in (14 cm) in length. 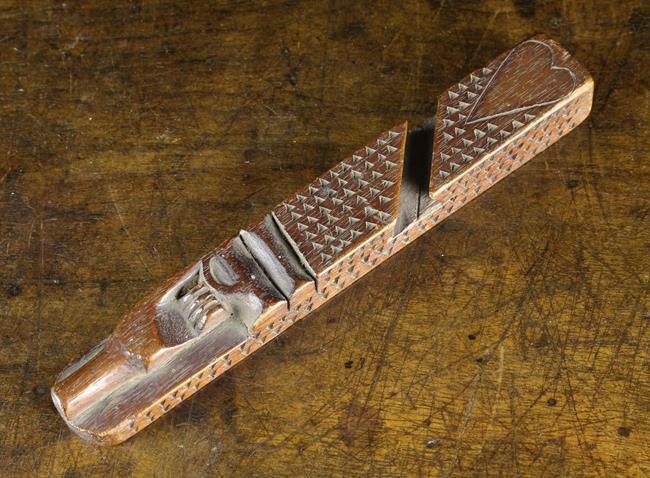 A 19th Century Treen Knitting Sheath of square section; enriched with tiers of decorative carving above a hollowed out 'lantern' enclosing a rolling ball, and tapered square finial end, 5 in (13 cm) in length. A 19th Century Chip Carved Mahogany Knitting Sheath carved with a hand holding a tankard, with an incised heart and initials I and E, 6½ in (16.5 cm) in length. 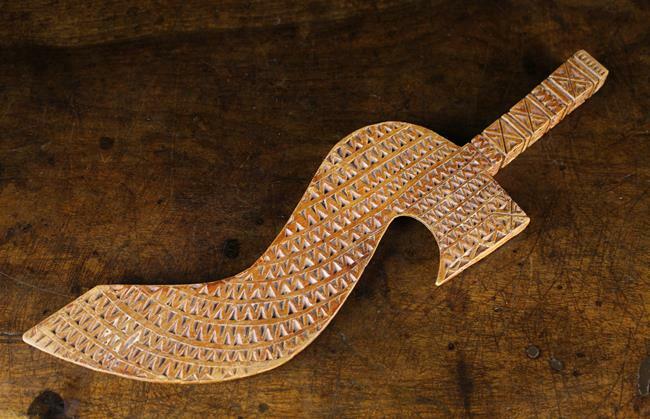 A 19th Century Chip Carved Goosewing Knitting Sheath, 12¼ in (31 cm) in length. A 19th Century 'Blind Jack' Carved Treen Table Snuff, Circa 1850. 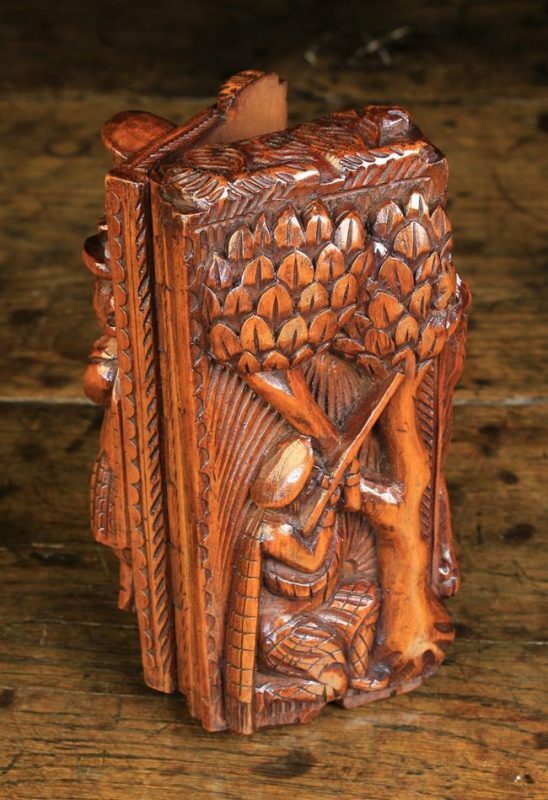 The rectangular box carved in relief reputedly by 'Blind' Willie McGregor of Glasgow, with highland dancers to the lid, a Scottish huntsman to the base and animals to the sides, 2¾ in (7 cm) high, 6¾ in (17 cm) high, 3½ in (9 cm) wide. 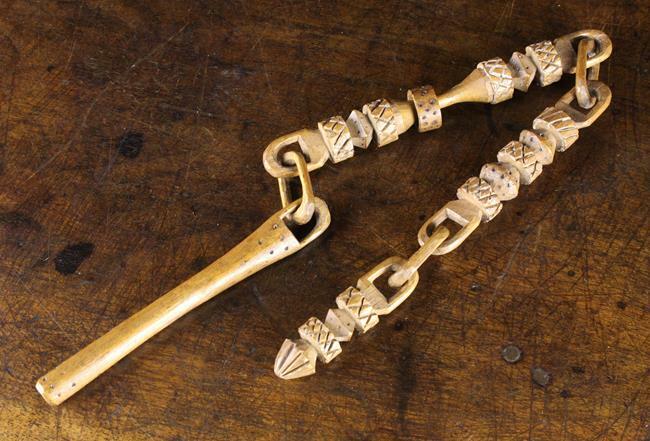 A Rare Antique Treen Knitting Sheath threaded onto a chain of intricately carved links worked from a single piece of wood. 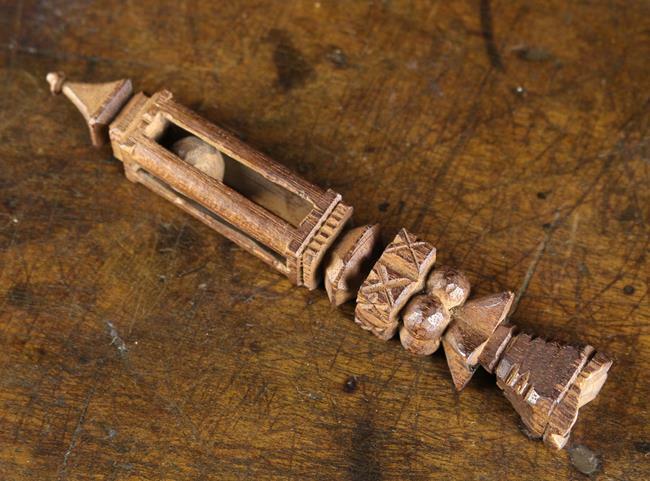 The components gouge carved with crosshatching and nail punched with dots, 15¾ in (40 cm) in length. 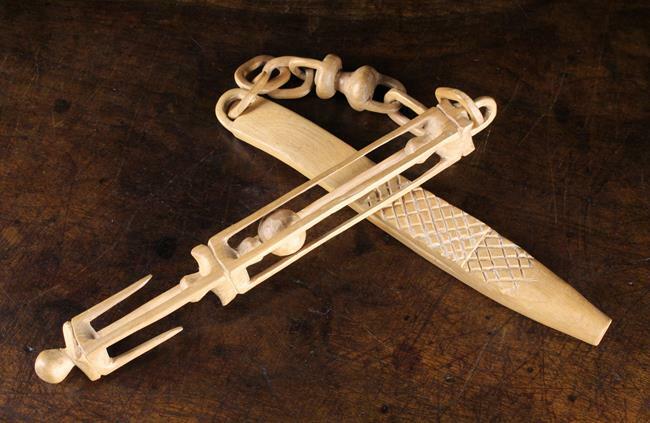 A 20th Century Boxwood Knitting Sheath, Chain and rolling ball wool hook, expertly carved from a single piece of wood with crosshatching to the belt hook on a fine oval link chain with swivel link to the centre and a square hollowed out 'lantern' pendant encasing a rolling ball, 21¼ in (54 cm) in length. 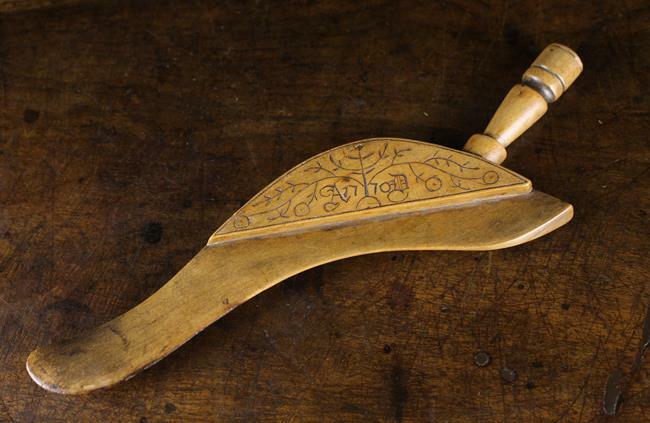 An 18th Century Boxwood 'Goosewing' Knitting Sheath decorated with incised sprays of foliage and dated 1770, 10½ in (27 cm) in length. 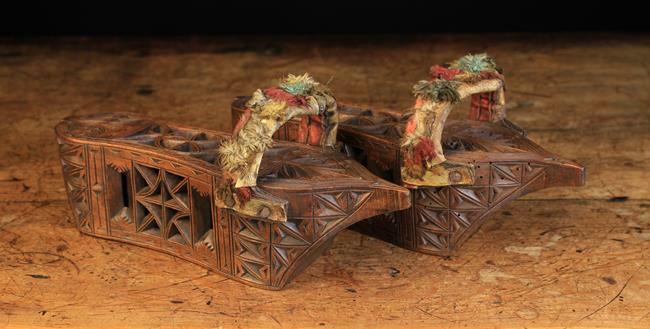 A Pair of Pierced & Chip Carved Wooden Pattens with pointed toes and fabric clad straps embellished with colours silk tassels, 9¾ in (25 cm) in length.